I am quite ashamed to admit that I have never really bothered with skincare. In fact, for the majority of my uni life I didn't even take it off before bed! Yep- I slept in my make-up. About 5 days a week. It's a good job I don't suffer with problem skin because I would definitely be suffering with severe acne and blackheads the size of moon craters by now. At most I used a make-up wipe. I think I used toner once..? But that was when I stayed over a a friends house and it was all she had. So yeah. My skincare regimen was pretty abysmal. It was only until about a year ago, when I received a bottle of MooGoo Anti-Ageing Face Cream at a blogger event that I started realising how much softer and more hydrated my skin felt after applying. I have oily/combination skin, so I've always been a bit wary about smothering my face in moisturiser before bed, with the fear of waking up glued to my pillow with a layer of grease but this was the opposite! My skin felt fresh, hydrated and clear. 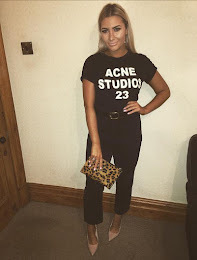 After I came back from Thailand, and given my delicate skin an absolute hammering on the sunbed pre and post holiday, I decided it was time to give my face a little more TLC. I mean, I've come to terms with the face I'm gonna look like a leather bag by the time I'm 30 but I would rather be a polished tan Mulberry Alexa rather than a crusty, battered old satchel from 10BC. Which brings me nicely along to the holy trinity of skincare! I know it's gonna sound a bit biased cos it's the first 3-step set I've bought and used by oh my GOD it's good. 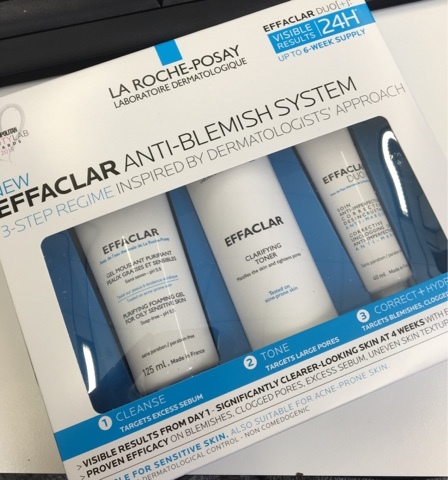 I bought the La Roche-Posay Effaclar anti-blemish system after hearing rave reviews about it online. Which is always a good sign. I did some research- it's for oily skin. GREAT news. It just so happened that the day I went online to purchase, it had a massive 30% off HERE so it was £24 instead of £35. BARGAIN. You only need to use a tiny bit of cleanser because it lathers up so much and it feels so soft on your skin, a lot kinder than other facial washes/scrubs I have previously used! The toner reduces the appearance of my pores, and again, felt so refreshing to apply- especially after 9 mins on the sunbeds. The moisturiser added instant hydration and didn't feel 'heavy' at all- I've also been using it in the morning before I apply my foundation. My favourite products are the purifying gel (which you can purchase HERE) because it gets every scrap of make-up off (aside from mascara, but I just use the toner for that) and makes my face feel so clean and fresh. And the moisturiser (which you can purchase HERE) because it makes my skin feel so soft and hydrated and DOESN'T feel heavy which is an absolute must for me when buying moisturiser. Reference - Logan, P. (n.d.). FenFast 375: Natural Weight Loss Solution. Retrieved March 20, 2019, from https://phenofficial.com/reviews/fenfast375/.